Its been slow going in the new grooming room. Mainly cause I haven’t been working on it. I’ve been either too busy or too lazy. After all the knocking out of old walls and emptying the place out I kind of lost steam for a while. 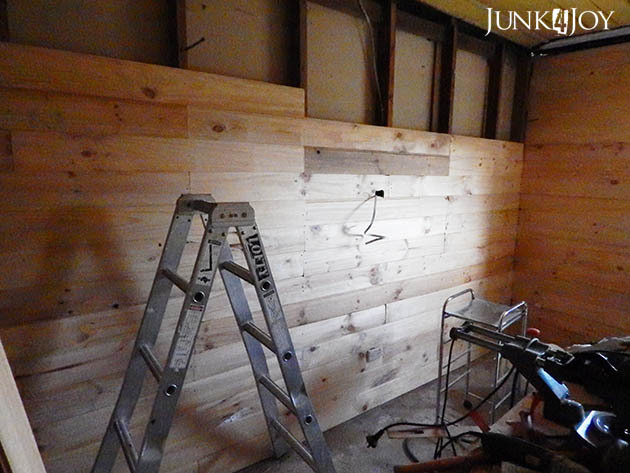 I had to buy pine lining for the walls and even though I bought the cheapest stuff around it was still a lot of money. That put a damper on things for a while. Then I didn’t know how to use the air compressor. Then I realised I needed the right nails for the nail gun. But its just a shed, right. Who cares if its not perfect. It’s not like its the kitchen, right? Well, a good friend came out and gave me a hand to get started. She’s done this sort of thing before. She knew how to use the compressor and how to change bits on the nail gun and she’s tackled way bigger jobs than this. As a result, the door was trimmed down with her saw (one that’s made especially for cutting long straight lines) and hung. And the wall around the door (the smallest wall) was done. Yes, I can see light too. 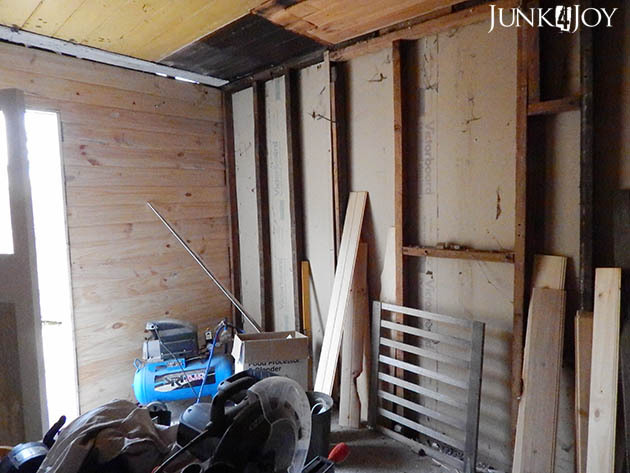 The ceiling in there is really crap so there’ll be a lot of fiddling to get the wall to join the ceiling properly. Maybe I can just put up a board and cover the holes? Today, before it got too hot, I tackled the other wall. I stopped when I had to climb up and down for each board. Plus I had to stop birds from getting into the wall before I got to the top. I chose to staple bird wire into the gap between the flat roof part of the casita and the wall cause there were a LOT of bird skeletons in that wall. I don’t want that happening any more. I mean its awful hearing them in the wall and it smells when they die. 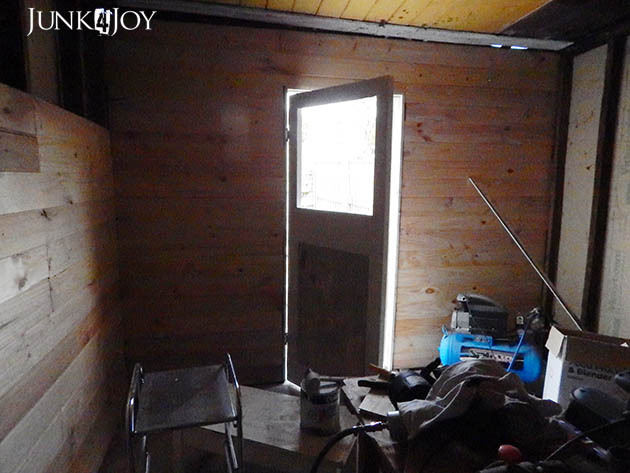 I also gave the door its first coat of paint, an oil based 3 in 1 undercoat. It’s an exterior door. It needs to be protected from the elements, hence the oil paint. I normally prefer water based paint cause it doesn’t smell as much and dries quicker. Last week I got a tin of aqua enamel deep base on sale and had it tinted a bright blue. I’m thinking that’ll be the colour on the outside of the door. I was planning on white for the inside and I’ve left the inner bottom panel unpainted cause I love the chippy look (though I sanded it back so there’s no loose paint any more). I could change my mind and do the whole door blue, but we’ll see. I like the chippy paint and don’t think that’d go with the blue. Of course, the door still needs a window. I have to see what timber I’ve got and make that. I’ve made doors before successfully (see my new linen cupboard) so how hard can it be? I think the only time I’ll run into problems is when I have to use the router to make a groove for the glass to sit in… never attempted that before. It’ll be fun for sure! Its getting to the good bits now. And I checked. That room is way cooler than the current grooming room, even on a really hot day like today. With both doors open there’ll be enough of a cool breeze to keep me sane. Oh, see that play pen side? That will be fitted to one or other door to keep dogs in. There’s a tiny yard outside the room which, once I fit a gate to the back part, will be totally secure. Its been cleared out and I’ll be putting down newspaper, weed mat and pine bark to keep it dry and clean for visiting dogs. If it wasn’t so hot. I think I’m only good for a few hours work when it’s hot. Then I need to do quieter stuff. Not like I haven’t got tons of that to do either. That room is looking real nice. I like the boards you are using. I can't wait to see what you're going to do with the drawers! I know it must be tedious to go up and down the ladder for every. single. board. Don't you wish you had a helper?!! That was good to block the access so no more birds will die. I can't wait to see the whole project finished. Thanks. It wouldn't be so bad if I didn't keep thumping my little finger with the rubber mallet. LOL It surely was faster with a helper.